It does not matter is it winter or summer season all women want to look amazing in their jeans. Are you looking for an effective training routine in order to tone your body and sculpt beautiful and strong legs? Then you have come to the right page as we can give you six moves to get leaner legs. This workout routine is aimed to work on your lower body and sculpt lean muscles. You should know that if you perform cardio training routine regularly combining it with healthy eating you will improve your results. Though this workout will not take much time it is really difficult to perform. Challenge yourself with this training routine and you will obtain legs you have always dreamed! 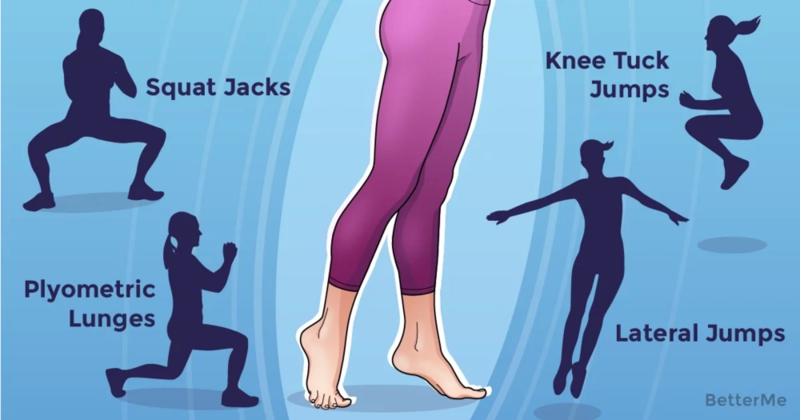 There is nothing better for your legs than performing fat burning exercises such as squat jacks, plyometric lunges, knee tuck jumps, hip extensions, plyometric plie squats and lateral jumps. Each move should be performed for forty-five seconds. You may rest every fifteen seconds after each exercise. Do two rounds of the following circuit. In order to start this workout you will need an interval timer and a mat. That’s it. It is not only beneficial for your figure but for your time and money as you do not need to buy an expensive gym membership or to drive back and forth to a gym. Sounds awesome, doesn’t it? Scroll down to see the instructions and start sculpting your dream body! It is time for a change, ladies!